In this review of the Yamaha MSP5 we are going to covering 5 important areas which include key features, what we like, pros and cons, who is this product best suited to and what customers who have bought the speaker are saying about it. 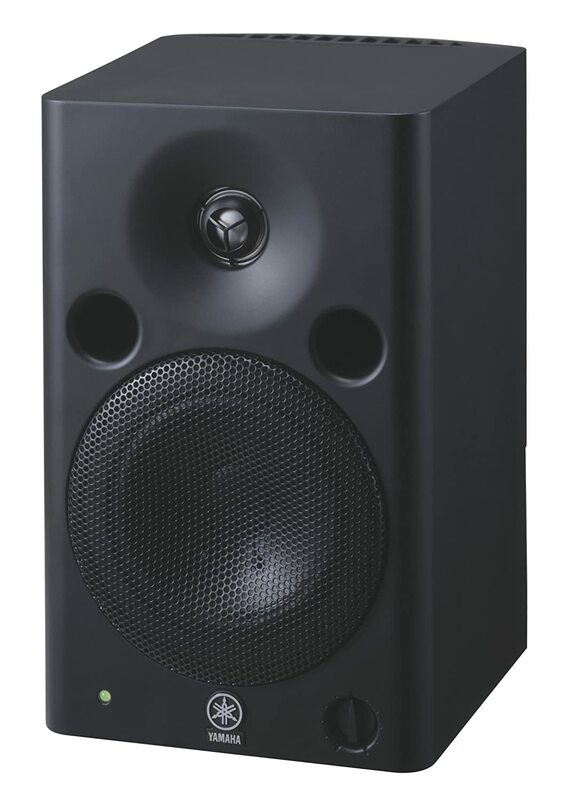 Active Speaker – The most prominent feature of this studio monitor is that it has a built-in amp. There are several benefits to using a powered studio monitor, especially a true active monitor like the Yamaha MSP5 that features separate amplification for the woofer and the tweeter. The less desirable alternative is a monitor with one amplifier that powers both transducers via a passive crossover. With a powered studio monitor, you know that your amps match your drivers perfectly, and you don’t have to purchase and install a separate amplifier for your studio monitors. Ample Tonal Control – Studio monitors have one objective, and that is to reproduce the audio signal that is played into them accurately. Discrepancies in your acoustic environment can, however, influence the accuracy of your monitors’ sound reproduction. To help you compensate for these discrepancies, Yamaha added two adjustments called Low Trim and High Trim. You can use the Low Trim to attenuate bass with a 60Hz shelf filter in steps of -3 dB, -1.5 dB, 0 dB, or +1.5 dB. You can also use the High Trim to adjust the output to the tweeter in steps of -1.5 dB, 0 dB, or +1.5 dB. Settings at 0 dB for both High- and Low Trim produce the most balanced sound. Magnetic Driver Structures – The woofer and tweeter have magnetic structures to achieve proper shielding while maintaining the speaker’s magnetic circuit to ensure minimal distortion levels. In combination with the high-performance amplification components, these drivers can deliver a maximum sound pressure level of 101dB, which is more than most sound professionals would need in their recording studios. 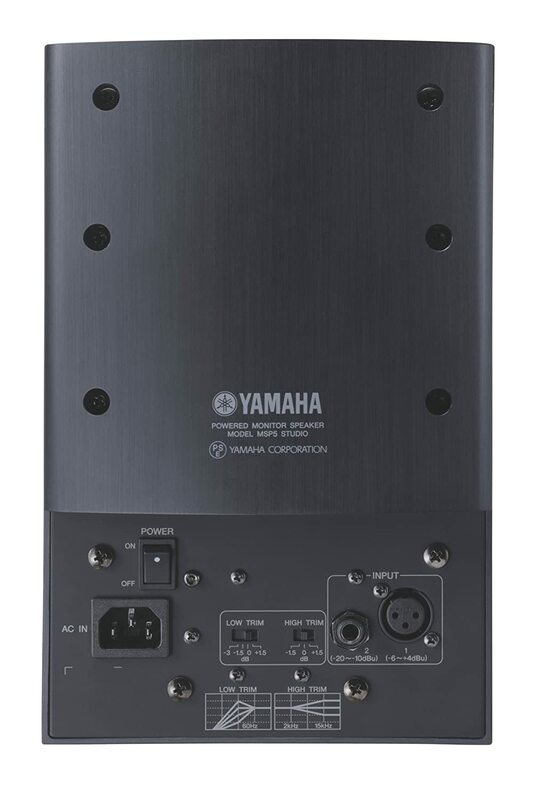 Enclosure – The Yamaha MSP5 has a high-quality enclosure with a modern and efficient design. The ports are at the front, which allows you to easily detect airflow and gauge whether there is energy that you may not be able to hear. For added convenience, the main volume control is also located at the front. The enclosure has a low-responsive design to deliver the most accurate sound reproduction, and the tweeter is fitted with a waveguide horn to deliver a wide high-frequency dispersion over 120 degrees. The cabinet has a size of 10.5” x 9.8” x 15.5”, which is perfect if your studio is limited on space. Audio Delivery – Public Address or home entertainment speakers are specifically designed to reproduce high-quality sound. Studio monitors are intentionally different than conventional speakers as they are designed to reveal flaws in your mix. The feature we like best about the MSP5 as a studio monitor is that if your mix sounds good on them, it will sound good everywhere else. They also offer a full frequency range and will reproduce the highest and lowest frequencies in your mix accurately as well. These models are also incredibly responsive to changes in their audio signal input. If you like to hear the slightest imperfections or variations in audio, these monitors are ideal. Has a heavy weight of 17.4 lbs. If you’re looking for something to provide you with listening pleasure, these models may not be for you. Home entertainment systems and other powered speakers may feature things like smart amp technology or dynamic EQ adjustments for the sole purpose of offering warm and clean audio. The monitor speakers have none of that, however, and they only reproduce what is being fed to them. For this reason, they are best suited to sound professionals or artists for recording studio purposes. You can, however, use them in a 5.1 surround sound system. They are sold separately for this very reason. Clear and Accurate Sound – According to several reviews, these units produce a clean and clear sound across the frequency range and are perfect for studio applications. Compact but Powerful – With its power rating of 67 Watts, customers found that this monitor has enough power – even for large studios or rooms. Durable – This product has been on the market for some time, and several reviewers note that longevity is one of the most valuable features that this monitor has to offer. Heavy Weight – One of the drawbacks of this unit, according to some reviewers, is that at 17.4 lbs., these monitors are quite heavy. The Yamaha MSP5 is a tried and tested studio monitor that is a valuable addition to any professional recording studio. What makes this product stand out from reputable units like the NS10 is that it’s an active studio monitor with built-in bi-amplifiers. It also features sufficient tonal control; the drivers feature magnetic shielding to reduce distortion, so it offers accurate audio signal delivery over its entire frequency range. Furthermore, the enclosure is compact, designed for convenience, and offers a wide high-frequency dispersion. The cabinet is dense and has a low-responsiveness to increase accurate audio reproduction. If you need a studio monitor that’s reliable, functional, and that offers value for money, this model may be perfect for you.